Richie Hannah: CEO & Founder of Yellow Cap Media - previously at GreatCall/Jitterbug, Jenny Craig, Nestle, Provide Commerce & ProFlowers. 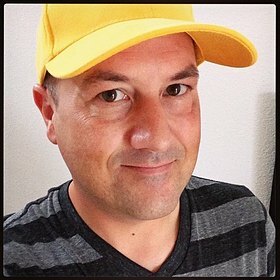 Richie Hannah is the Founder and CEO of Yellow Cap Media, a California based Web Development, Design and Digital Marketing Agency. The agency serves a wide variety of clients, in industries from E-commerce to Medical to Legal. Mr. Hannah has been at the cutting edge of the digital revolution for 20 years, since realizing the early internet had vast potential to transform commerce, government and society. His key strengths include breadth and depth of digital experience, from startup to Fortune 100, design to software engineering, branding to direct marketing, hands-on to corporate management. Prior to building Yellow Cap, Mr. Hannah served as Director of Digital at GreatCall, the inventor of the Jitterbug cellphone for aging Americans, and a leading provider of digital health and safety services. He built high performing web, mobile and digital marketing teams, generating triple digit e-commerce growth with a double digit reduction in cost. Two of GreatCall’s mobile apps reached #1 in the Health and Medical category of both the Apple App Store and Google Play under his tenure, with over one million app downloads. From 2008 – 2011, Mr. Hannah served as Director of Web Development and Content for Nestle’s Jenny Craig weight loss division. He was responsible for their consumer-facing web properties, serving 8m+ annual visitors, and executed an iterative testing process that generated over $5m incremental lifetime revenue. He managed internal teams and external agencies, eliminating legacy friction between IT and Marketing organizations. After joining one of the first internet companies in Scotland and teaching himself the skills required to build websites before formal training and modern tools were available, Mr. Hannah moved to Southern California to join the startup team of ProFlowers in 1998. He played a key role in growing the company from fledgling flower e-tailer to nationally recognized multi-brand public company under the Provide Commerce name, acquired by Liberty Interactive. GreatCall is the inventor of the Jitterbug cell phone for aging Americans, and has matured rapidly into a growing provider of health and safety services and mobile apps. I was hired to take over digital and app marketing, then expanded my responsibility to also cover website development and operations. From scratch, I built a high-performing internal team, and effectively directed them and several external agencies to accomplish the following: Digital Marketing •	From 2012 to 2014, managed and optimized a digital channel blend of paid search, display & mobile advertising, search engine optimization, affiliate marketing and social media marketing, resulting in: •	Double-digit % increase in digital advertising impressions and organic search engine traffic •	Triple-digit % increase in GreatCall.com monthly traffic and e-commerce sales •	Double-digit % reduction in digital cost per sale Website Operations •	Replaced legacy process between marketing and technical teams by building a cross-functional team, aligning web, marketing, software, IT systems, billing operations, customer care & sales. •	Transitioned from a traditional waterfall development process to an agile scrum environment, increasing project efficiency and accuracy. •	Implemented technologies such as Adobe Analytics, Tealium Tag Management and GitHub, to improve web analytics, site performance and development efficiency. •	Managed the analysis, design & implementation of a modern, simple ecommerce shopping cart. •	Implemented responsive design techniques to optimize key website sections for mobile devices. Mobile App Marketing •	Launched MedCoach medication management, 5Star personal safety and Urgent Care medical alert apps on iOS and Android platforms. •	Both Urgent Care and MedCoach have been the #1 medical app in both iTunes and Google Play. •	Progressively tested mobile advertising networks and agencies to increase app install rate, generating over one million downloads. As a major national brand with 8m+ annual visitors, Jenny Craig's consumer-facing websites are critical to acquiring new and retaining existing customers. I was hired to manage the development and optimization of the company's global web operations, my responsibilities then expanded to cover all web creative & content. o	Managed internal team and digital agencies to produce compelling content and functionality to improve conversion of potential clients and delight existing clients in support of marketing strategy. o	Overall responsibility for conversion of website visitors to contacts and sales. Increased contacts by +4% in challenging economic environment. This translated to a +7% increase in contacts per visitor, and +7% increase in sales per visitor. o	Reduced page response time by -2 seconds (33%) from 2009-2010. Increased availability +0.2% and improved consistency by +37%. o	Implemented A/B/n testing framework & success-tracking methodology, then executed iterative testing process which generated over +$5m incremental annual lifetime revenue. o	Developed Social Media, Mobile App & Website strategy & implementation o	Defined & implemented process throughout web operations to increase quality, improve efficiency and communicate effectively. o	Developed & maintained comprehensive, automated web metrics dashboards to trend & understand key web activity, identify top opportunities to increase conversion & improve customer experience, communicate learning to leadership and key stakeholders. o	Developed & implemented content hosting & systems ownership strategies. Keywords: Web, Marketing, Strategy, Digital, Conversion, Development, Web Analytics, SEO, Creative, Design, Customer Experience, Usability, UI, Social Media, Mobile, Acquisition, Retention, Content, Process, Site Optimization, AB Testing. After teaching myself html by viewing the source code of very early websites, designed and built over 20 websites using proprietary development platform for clients including Sony Europe, the Scottish Qualifications Authority and General Accident Insurance.